Move the cursor above or tap twice the icon you are interested about. A popup will describe its functionality. In OrthoGraph Architect you are always working on the particular room you are in. Therefore there is a structure behind the drawing which is based on the hierarchy of the site. The elements of this structure are the locations. For a general use these locations are typically rooms, but sometimes they are building parts without the need of representation on the floor plan, like floor, apartment, building etc. What are than they for? Two reasons: they are grooping the rooms, and they also bear some information (for example the floor can define the floor level allowing modeling multi-story buildings). As said above, locations are placed in a hierarchical structure: Building->Building part->Floor->Apartment/Office/Shop->Room/Zone. You do not have to build up this structure, you can enter to it on different leveles: on Building level, on Room group level (Apartment/Office/Shop) or directly on Room level. If you add a new location, you add it to the current level, or to a level below. By pressing the Edit button you can rename it, and by pressing the Property button on the bottom view bar you can change its properties also. Actual locations’s name and position in the physical structure. By pressing the “?” button the app displays a 9 page tutorial showing the most important functions of the software. The first step is to create a project. The first time you open OrthoGraph Architect, you will see one project called “New project 1″. You can access the project list on the top right corner on the top status bar. After pressing the project button you have the project list, where you can modify the name of the project. For this you have to press the Edit button on the top right of the project window, or you can add a new project with pressing the + sign left to the Edit button. You can also delete any project, but you can leave this project window only if you have at least one project open. The delete function is available while editing the project list, left to the project name there is a dash (-) sign. After pressing this, a Delete button appears on the right side of the project name. If you are not in edit mode, you can make this button appear by swiping your finger to the right or left on the name of the project you want to delete. Here, you can sign in to your Orthograph Cloud account. If you are not a user yet, than with the “sign up” button you can create an account. Using Orthograph Cloud have great benefits. You can save your projects to the cloud, and if you have Pro or Business subscription (free for the first month during the introduction period) all uploaded states of the projects will be stored automatically. These versions can be retrieved anytime giving you additional safety. As a Pro customer you can share your uploaded projects (even old versions!) with other Pro customers, and then these files can be further developed independently. As a Business customer you get even more: the real collaboration with your colleagues. You can survey the same building the same time with a group of surveyors working on the same project / drawing. Toolbar tabs are concentrating typical tools of different work phases. The second line of the toolbar is common in all tabs. Drawing toolbar contains the drawing and basic floor-plan manipulating tools. When a drawing is sketched, and the beginning and the end of the room polygon needs to be closed, then the Close Polygon tool can help to do it with one click. If the beginning and ending points are near to each other, then OrthoGraph lengthens these walls to intersect each-other in the last corner. If there is a larger distance between these walls, then OrthoGraph inserts a connecting wall between the endings of them. A room polygon drawing can be modified at anytime. After choosing this tool you should tap a corner, and hold your finger on the screen. As long as you move your finger on the screen the particular corner will follow it. When you release your finger from the screen, the corner will remain at its new location. The move corner function also has a snap functionality, you can set it while the function is activated. Three main options are available, Normal snap, No snap and Snap to 90. in Normal snap mode you have the option to snap the corner angle to 15, 30, 45, 60 and 90 degrees (and their multipliers). This means if you set e.g. 60, than the wall starting from the corner you are moving will highlighted in blue when the next cornerâ€™s angle is 60, 120, 180, 240 or 300 degree. There is a third use of this command, you can also resize wall openings with it. Select the Move corner, tap one endpoint of the door or window to be resized and swipe your finger. The wall opening will grow or shrink accordingly. Sometimes the sketch recognition does not identify all points you wanted to draw, so sometimes you need to use more detail in the polygon as it was sketched. Using this tool it is very simple to add new corners to the room polygon. Tap the wall you wish to break into parts and move your finger on the screen until the new corner is in the proper location you wanted to have. Next release your finger from the screen and the new corner will remain in its desired position. Sometimes the sketch recognition creates additional corners that are not needed as part of the room polygon. The Delete Corner tool can help in this case: tap the corner to be deleted, and in that moment the particular corner disappears. It is important always to have exactly the amount of corners the room polygon should consist as e.g. intermediate corners in a wall might cause failures later during the measurement process. In many cases it is needed to have bended segments in a floor plan. These segments can not be sketched, but later in the drawing process, linear segments can be bended. OrthoGraph can handle only bended segments that are part of a circle. To bend a segment choose the bend wall tool, tap on the screen,, and holding your finger on the screen bend the segment to the direction you wish. Bended segments can be straightened. Tap the screen at the bended segment you wish to straighten and it will become straight. In many cases it is easier to create the rough polygon of a room, and then make it detailed later. The add housing function can help a lot, you simply have to draw where you need housing in a wall. After you have sketched the housing onto the screen above the desired wall, OrthoGraph will integrate it to the existing wall segment. Draw the housing as you would draw with a pencil on a paper. Hotspots are used to store exact positions of important points during you survey. If there is an object or a point you wish to place exactly, or make a note of, within your floor plan, then hotspots are the tools for that. A hotspot acts like a corner in the wall. It can be surveyed to any other two points, and it also can be used as a reference point of a distance measure. If there is a wall, in which the length cannot be measured as e.g. a bookshelf stands there, then using a hotspot (that directly sees both ends of the wall) the two endpoints of the wall can easily be measured. Then the hotspot should also be measured from other corners, and the partially hidden wall can be clearly measured. To place a hotspot just tap the screen in the required position. Hotspots can be moved using the Move Corner tool as it were a corner in a wall. If there is a hotspot that is not needed anymore, then it can easily be deleted from the floor plan using this tool. Tap the particular hotspot, and it will be instantly removed. Undo dismisses the last operation made in OrthoGraph. Each time you tap the Undo icon, OrthoGraph will undo the last operations step by step. After one or more undo operations have redone the lastly undone operation made in OrthoGraph. In case you have done more undo steps backwards you can redo them again one by one with the Redo feature. Fits the walls of the currently active room to the screen. Tapping twice quickly fits the entire drawing to the screen. Activates gestures adjusting the view like pan for moving and pinch for zooming. Pan with two fingers is always active. Selecting any drawing element after activating this tool, you can watch and set its special properties. Most drawing elements can store properties like alphanumeric parameters or in many cases even photos of the particular wall or drawing element. Click the Properties icon first, then tap the particular drawing element on the screen to access its properties. A properties window appears that shows the list of properties and their current values. Tapping any of the values switches it to edit mode where entering the new value is simple and available. by image properties tapping the image button in the actual line brings up the currently attached image. If there is no image yet, a gray camera icon appears. Tapping the current image or the camera icon the iPadâ€™s camera turns on, and allows making and then attaching a snapshot from the current view into the particular property. by inherited parameters like wall height (defined by the room) the property is read only by default. To detach the inheritance the blue flag before the property has to be tapped, which makes it gray and the property editable. One of the most important features of OrthoGraph, it helps measuring the distances between corners and other reference points of your drawing. To start a measurement choose a point tapping it on the screen, and then holding your finger on the screen move it to another point that you want to measure from the first one. OrthoGraph always reflects the entered distances instantly by moving the secondly chosen point from the first chosen into the direction of measurement. By measuring a point from another one OrthoGraph first tries to move it without having the drawn angles unmodified. If it is not possible anymore (because of the details of your measurements) OrthoGraph will also update the angles related to the measurements. From version 3.0 in OrthoGraph Architect it is available to view the created (and surveyed) floorplan in 3D. In 3D view mode you have 3 navigation tools, on the left, you have a joystick for going forward, backward, left and right (you have to move the circle in the middle to up, down, left and right respectively), and looking up, down, left and right with the joystick on the right. The third tool is a slider on the right edge of the screen, which is for lifting the viewpoint. In 3D mode only a selected set of the icons are active, you can see and set the properties of objects, walls and wall openings, and you can create screenshots and send it via email or to Dropbox. Here, you can subscribe for Orthograph cloud services, or buy functionalities. This is the active functions icon. It is displayed for giving visual feedback which function is active, and by pressing this icon the toolbar will hide itself. Pressing again it will appear again. The floorplan view allows the freehand drawing of a room polygon (just draw like you were drawing on a paper with a pencil), and also after the sketch, the software will recognize the floor planâ€™s corners and walls. OrthoGraph always works on one room at a time, therefore one polygon can be created at a time related to each physical structure element. After the sketch-and-recognize phase you can measure the walls and other details in your drawing. All changes you make relfets immediately on the screen giving you a perfect feedback and allowing you to make corrections if needed. The result will be a precise and correct floor plan. Still in this view you can add doors, windows and objects (furniture) and save the results to Dropbox, or send via e-mail. There is also a 3D mode available wher you can make a virtual walktrough within your freshly created floor plan in 3D on the spot. The Property Sheet view gives access to all parameters related to the particular structure element. It can be of a type of textual data, photo or number. For example it can be the flooring texture, a photo of room, height and elevation data etc. Report view is an alphanumeric view of graphical calculations related to the particular structure element. The current Room’s area, wall surface and many more are listed in a read only format as well as a summary of all elements below the current one are also available (e.g. in case of stories or buildings). 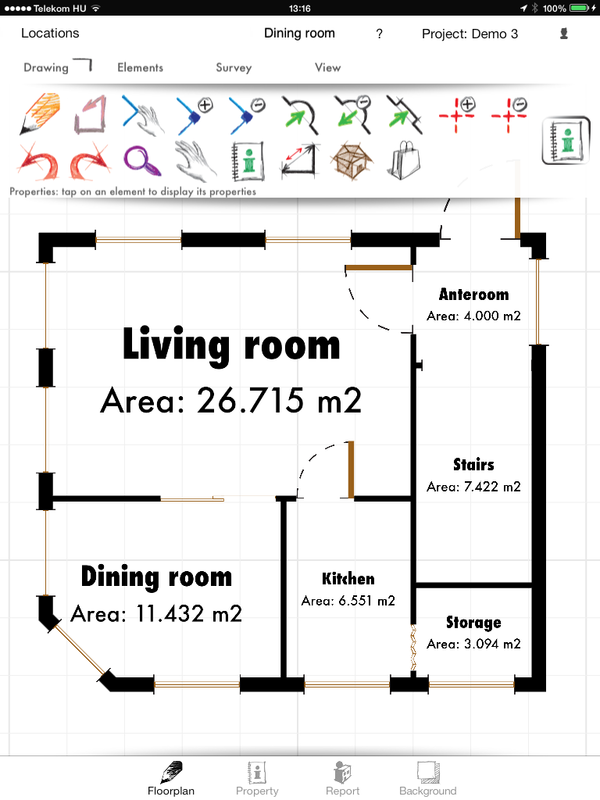 You can set images as background to the drawing for helping the creation and measurement of floor plans. If you have blueprints or digital plans (e.g. high resolution flattened point cloud images) available, you can use them as background images for your sketch, so you can fit your walls drawn to the background floor-plan images. Copyright © 2013 Orthograph. All rights reserved.